I'm sure most of you know by now, but there will be no more Google Reader by July 1st. That made me so sad because I subscribe to all of the blogs I read in Google Reader! Since it will soon be gone by the wayside, those of us still using it need to go elsewhere. Blog Lovin' is a blog reader and they have a handy little button that imports all your subscribed blogs from Google Reader for you! It was super easy and took less than a minute. To stay up to date with Meal Planning 101, I suggest you follow my blog with Bloglovin. Feedly is another blog reader and will also import your blogs from Google Reader. After trying both, I think I liked feedly better. It was the most like Google Reader and the easier of the two to get used to. But it's up to you! 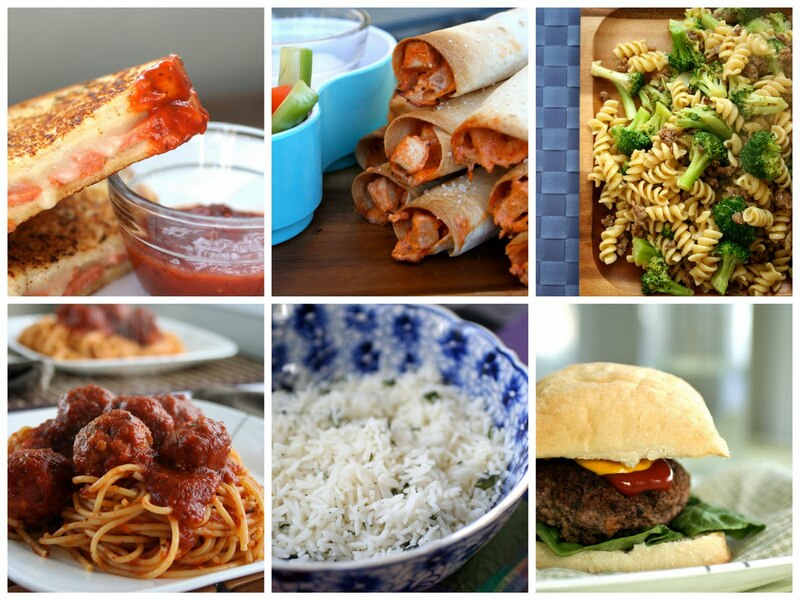 I pin all my new recipes on my Pinterest board Meal Planning 101 so you can follow me there. I also post lots of other food that is inspiring me, recipes that I tried and liked, my meal plan links, and any recipes I'm using that week in my meal plan. Here's the link to my boards to check them all out! Meal Planning 101 has it's own facebook page updated when new posts go up or when I have interesting pics or statuses to post. If facebook isn't your thing, I am also on Twitter. While I hardly ever post anything food related, if you are interested in following me on Instagram my user name is kindrabirss. Oh my gosh, this is such a long overdue post! 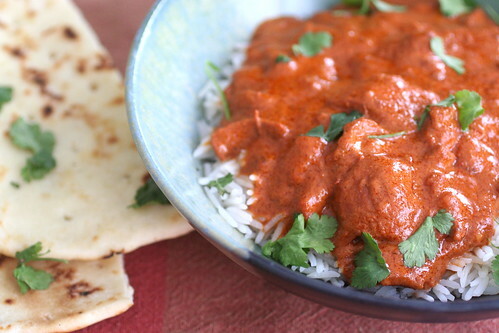 I've been meaning to add this as well as update the terrible butter chicken photos I had before but it has truly taken me forever and a day to do it. But now I have! Yay me. 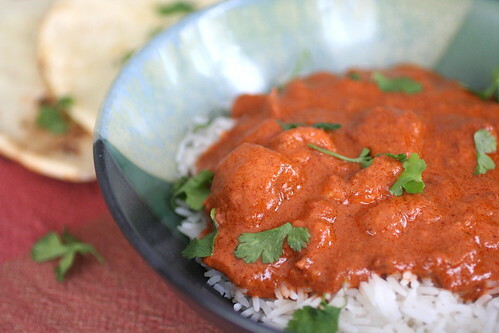 My Slow Cooker Butter Chicken recipe has become the second most popular recipe on my blog (coming in behind Slow Cooker Tikka Masala). I think the reason is that it's so easy to just chuck everything into the crockpot and be done with it and the other reason is that its so dang delicious! But what happens when the slow cooker no longer becomes convenient? What if you plan on making this recipe for dinner or for company and you forget to get it in the slow cooker in the morning? (Not that I've done this a dozen times or anything). Nope, there's no reason to make something else, just cook it on the stove top! I find myself using this method quite a lot since I sometimes forget to get my act together and get it in the slow cooker in the morning. This will take an hour or two to simmer as opposed to 4-8 hours in the crockpot, so if you find yourself short on time, try this. In a large frying pan over medium high heat add the butter, oil, chicken, onions and garlic. Season with salt and pepper and saute for about 5 minutes or until the onions are translucent and the chicken has a bit of color on it. Add the cardamom, curry powder, tandoori masala, and garam masala and cook the spices until fragrant about 1 minute. Add the curry paste and cook for another 30 seconds to a minute. Add the coconut milk and tomato paste and stir well to combine. Let come up to a boil and then turn heat down to low and cover with a lid (the large frying pan I use doesn't have a lid, so I cover with tinfoil). Simmer for 1-2 hours (longer is better), stirring occasionally. Season well with salt and stir in plain yogurt if using. 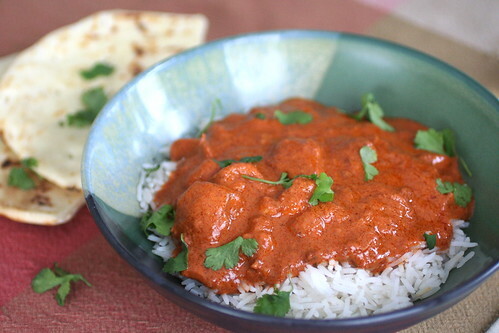 Serve over basmati rice with naan bread and garnish with cilantro if desired. If you are looking for ideas for where to find these spices, curry pastes and masalas, or you want to know if you can sub cream instead of coconut milk, etc, check the Results section of the original post where I put the answers to a lot of frequently asked questions. The grocery list is color coordinated by meal so you can easily pick and choose which meals you would like to make. Either print and use the grocery list as is and make all the meals I have planned, or easily cross off the meals and corresponding ingredients you would rather not make. Good Monday morning to you! We had a winter storm here last night so everything is covered in snow, the kids are bundled up in their pj's with blankets watching a movie, and I'm sipping on my second cup of coffee. I kind of love a snow day when I don't have to go anywhere :) The lazy morning and lack of distraction means I can post a new meal plan for you. It got me thinking when I posted about not catering to my kids tastes when I meal plan; I wonder what it would be like if I planned a whole week of meals that my kids love? Probably peaceful! Haha. So that's what I'm bringing to you this week. While you or your kids may not enjoy the same things mine do, I think it's a pretty kid friendly meal plan all around. Enjoy! If you ask my kids "what do you want to eat?" they shout in unison "Burgers and Fries! Burgers and Fries!" This recipe is great because you make more burgers than you need and use the leftovers to get a head start on day 2 and day 3's suppers. Grilled cheese and soup go so well together! Make a quick beef and vegetable soup with leftover burgers from the night before and your kids will love these pizza grilled cheese sandwiches. A super quick and easy meal. I remember when I made it for my family and there was not ONE SINGLE COMPLAINT, and I thought "I need to make meals like this more often." And it's super quick and easy too. My kids love finger food and dipping things in ranch dressing, so these taquitos and veggies with dip are perfect. Leave out the cilantro and lime in the rice for a buttery kid-friendly rice side dish. Do your kids love broccoli like mine do? I think cooked broccoli is the favorite veggie around this house, and when you combine it with flavorful sausage and pasta, everyone goes wild. For more meal plan ideas, check out my complete list of meal plans or check out Org Junkie's Menu Plan Monday. This was a recipe I came across on Pinterest and as soon as I did I was like "DUH! Of course you should put some pepperoni in a grilled cheese. Of course you should swap out regular butter for garlic butter. Of course you should dip it in pizza sauce when you are done!" Yep, definitely something I wished I would have thought of first. As soon as I pinned this I made it. It is such a simple concept, yet turns a regular grilled cheese into something special. Kids and adults alike love 'em. My husband was recording in his studio with some friends that had come for a visit, and I realized no one had eaten lunch yet. I went out there and asked if anybody was hungry. My reputation as a food blogger convinces everyone that I anything I make must be magic so they were exclaiming "Sure! I'd love to eat whatever you make Kindra!" but all I could think was "I'm just going to make grilled cheese. It's not like I'm doing anything fancy." 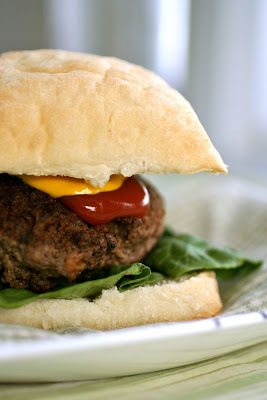 Despite the humbleness of the ingredients and the recipe itself, everyone was raving about what a great sandwich it was. "Best grilled cheese I ever had!" A great lunch or a quick and easy supper, I would definitely recommend these. Can I confess something to you? I really don't meal plan the same way I used to. After years and years of trying out recipes and scheduling out every meal I made, I came to learn from my flops and my successes. I've tried enough different foods now that I can figure out what will taste good together. Because of this, I only meal plan about half of our meals for the week. The other half, I throw fresh produce and meat that I find on sale into my cart, bring it home and let myself be inspired by the ingredients. I can go into detail about this in another post if you like but I'm really loving this shift in my cooking. I really wouldn't recommend this kind of meal planning if you have a crazy life with meetings and dance rehearsals and hockey practices and such to go to, but for me, I love to be creative so transferring that creativity to the kitchen is fun and exciting. This recipe came about when I looked at my fruit bowl sitting on the counter, with two sad and lonely looking tomatoes in it, and an avocado almost past its prime. I decided to make up some pico de gallo and guacamole. From there, I dug into the freezer where I found a pork loin roast. After defrosting it, I dumped it into my slow cooker with some leftover tomato sauce that needed to be used up in the fridge and for a smokey, slightly spicy hit, I dumped in some of our favorite Chipotle BBQ sauce....and these burrito bowls were born! They have been a HUGE hit with my family! I've made them a couple times so I could refine the recipe and take photos to post here, and everyone always has happy tummies. It's a great easy, and healthy meal that everyone can be excited about. Place pork roast in the slow cooker and pour BBQ sauce and tomato sauce over top. Cook on low for 8 hours. Prepare cilantro lime rice, pico de gallo, and guacamole. With two forks shred the pork. In a bowl place rice with shredded pork and chipotle juices over the top. Top with pico de gallo, guacamole and sour cream. I love it that a meal that is so easy, can also be healthy and delicious too! When I first made these I served them with a brown and wild rice blend instead of the Cilantro Lime Rice, and that works equally as well. I have a rule when we make tacos, sandwiches (or these burrito bowls) that my kids can pick whatever toppings they want for theirs, but the toppings must include at least 2 veggies. Since my oldest daughter hates fresh tomatoes and onions, pico de gallo is out for her. That leaves only guacamole as a topping so I add a bowl of shredded lettuce among the toppings for my family to pick from. She likes to drizzle her bowl with ranch dressing instead of sour cream as well. If you wanted, you could also stir in a can of drained black beans and frozen corn to the shredded pork. Everyone in our family loves that they get to doctor up their own bowl of rice and Chipotle pork the way they want to. If pork isn't your thing, I think this recipe would work equally as well with a beef roast. A couple years ago when I first made Creamy Beef Taquitos, I thought "what the heck do you serve with taquitos to turn them into a meal?" Plain rice seemed too boring. So I started by making a pot of basmati rice, which I always have on hand since we make so much Indian food. I stirred in a couple tablespoons of butter, salt and pepper which made the rice fantastic (it really emphasizes the nuttiness of basmati and reminds me of popcorn), but I still wanted it to have a Mexican influence. I noticed the lime and cilantro still sitting on my counter leftover from making taquitos and threw them both in. Perfect! A great accompaniment to any Mexican meal, or even Asian or Indian dishes. In a medium pot, bring water to a boil. Add rice, turn heat down to medium low, and simmer rice with a lid on for 12 minutes. Remove from heat and let sit for 5 minutes. Add butter, lime juice, cilantro, salt and pepper and stir through to combine. Serve. 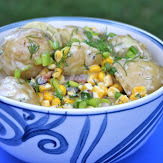 I love making this as an easy side dish that is different than just plain rice. The freshness of the lime and cilantro work nicely with main dishes that are rich (like Creamy Chicken & Black Bean Enchiladas) or spicy (like Buffalo Chicken Taquitos or Tandoori Chicken) or pretty much any Mexican dish. If you are one of those people that hate cilantro, fresh Italian parsley would be a great substitute - it would still provide you with the same fresh, herbaceous hit. Or really, have you ever just stirred lots of butter, salt and pepper into hot basmati rice? SO GOOD! I have tons of meal ideas for you, because this Cilantro Lime Rice is a great accompaniment to so many things! I never thought I'd be one of those parents to cook something just because you know your kids will like it. I'm a firm believer in introducing kids to all foods and all tastes and strongly against cooking a separate meal for the kids. They can eat what we eat. My kids have been exposed to so many different foods and love to eat curry, Thai food, gyoza, and many other things. HOWEVER, that doesn't mean they always enjoy it. One doesn't like fresh tomatoes, mushrooms, or onions, while the other one eats any and all veggies but isn't a huge meat fan....and every once in a while I do like a break from the turned up noses and the picky whines. So as I was brainstorming my meal plan over the weekend, I was thinking of doing something different yet pleasing to the kids (and the adults!) at the same time. Everyone in the family goes crazy when I make Creamy Beef Taquitos so I did a spin on that using chicken breasts I already had in the freezer. While there is Frank's red hot sauce mixed into the filling, it's toned down quite a bit because of the ranch flavoring, cream cheese and mozzarella. It was a great experiment! Line a baking sheet with foil and lightly coat with cooking spray. In a medium bowl, heat cream cheese in the microwave for about 20-30 seconds so it's soft and easy to stir. Add ranch seasoning and Frank's red hot sauce and stir to combine. Add the chicken and cheese and mix. You can prepare up to this step ahead of time. Just keep the mixture in the fridge. Place 2-3 tbsp of chicken mixture on the lower third of a tortilla, keeping it about 1/2 inch from the edges. Roll it up as tight as you can. If your tortillas are cracking or breaking, you can microwave them for 10-20 seconds with a damp paper towel over top. Once rolled, place seam side down on the baking sheet. Lay all of the taquitos on the baking sheet and make sure they are not touching each other. Spray the tops lightly with cooking spray or brush with a bit of oil and sprinkle some kosher salt on top. Place pan in oven and bake for 15-20 minutes or until crisp and the ends start to get golden brown. Remove from the oven and serve with ranch for dipping. *Alternatively if you don't already have cooked chicken you can place 2-3 chicken breasts in a baking dish sprayed with cooking spray. Sprinkle with seasoning salt, pepper, garlic powder and paprika and bake for approximately 30 minutes or until cooked through. Dice finely. I have this section here called "results" so this isn't one big gush about how totally awesome everything and anything I make is. It's here so I can be real and tell you our true and honest opinions of the recipes. So my kids real and true honest opinions were....they didn't hate it (Haha! That's what my 5 year old said). They ate it without any complaining or coaxing, so that was a plus for Mom. But my husband, the one who's favorite food in the world is hot wings, loved them! In the end it was a great compromise meal. The adults were happy and satisfied while the kids ate them, dipped them in ranch and then asked for more veggies to dip in ranch. Wins all around I think. Oh and if you are wondering about spice level, I think it's mild with a bit of heat. My kids said it was warm but they didn't complain it was too spicy. My husband, the spice fiend, went to his hot sauce collection and doused his in more hot sauce, while I thought it was perfect.